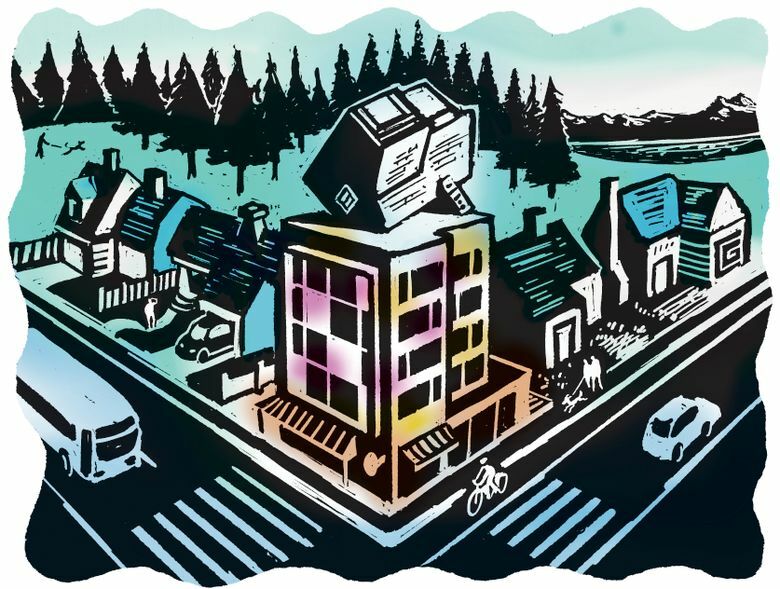 Seattle’s prized neighborhoods are under attack from three fronts. The City Council, together with state lawmakers, are working to eliminate all single-family zoning, confiscate property rights and haven’t even bothered to ask if that’s OK.
On Monday, the council is expected to pass its ill-conceived Mandatory Housing Affordability legislation. Originally it promised to diversify affordable housing choices within denser urban villages. Instead, it morphed into encouraging developers to buy their way out by paying ridiculously cheap fees-in-lieu, which will result in a modest number of housing units shunted to the edges of our city. Led by Councilmember Rob Johnson, he and his colleagues have bowed to development money while sacrificing true housing affordability. Many believe this legislation is illegal and as such may be headed for appeal. Meanwhile, the Legislature is advancing with two bills: SB5812 and HB1797, which would upzone single-family properties in larger cities statewide, removing your rights to object and appeal, while also usurping Seattle’s autonomy to manage its own land-use decisions. Among many “takings,” these two overreaching bills would allow multiple residences on every single-family property, with no limitations on ownership, parking, lot sizes, or number of residents per lot. The third front, pushed by Councilmember Mike O’Brien, would eliminate single-family housing regulations citywide, erasing 150 years of our history. Every property over 3,200 square feet could be converted to multifamily with the addition of in-home Accessory Dwelling Units as well as backyard cottages. Instead of one house, O’Brien proposes allowing three new residences per lot, housing up to 12 people, with no parking or long-term ownership requirements, no control over traffic and tree protections, and no provision for improvements in streets, sidewalks, schools, or our aging infrastructure. This triple threat to single-family neighborhoods is happening as council members Johnson, O’Brien, Sally Bagshaw and Bruce Harrell are edging toward the door. None are seeking reelection this year. And why would they? There’s little mystery behind their decision based upon their years of ignoring constituent participation, authoring exaggerated citywide upzones that intentionally disregard neighborhood and expert input, and favoring personal ideology, developers and money. Should we allow lame-duck politicians, who know they can’t get reelected, to advance their personal ideological and unpopular land-use agendas? City Hall no longer sees a need or value for public outreach and partnerships, turning its back on such bodies as the Neighborhood District Councils. The result? Blind, top-down decision-making, resulting in expensive and embarrassing gaffes, such as the “head tax” mess. Outreach to Amazon and others prior to proposing such a tax would have been an obvious strategy, but ignored instead by our egocentric and dismissive council. As a third generation Seattleite, father, architect and former Seattle planning commissioner, I feel the tensions between constituencies as we deal with accommodating population growth while preserving what makes living here such a blessing. As a planning commissioner, I helped draft the current regulations allowing in-law apartments and backyard cottages to respectfully increase density and diversity throughout every single-family neighborhood. The changes I worked so hard for have now become a political and ideological tool to convert every single-family neighborhood to one-size-fits-all multifamily development, degrading the quality of life for everyone. O’Brien and former Mayor Ed Murray attempted in 2016 to secretly advance their legislation without performing one environmental impact study or engaging even one neighborhood. The Queen Anne Community Council, with support from citizens and neighborhoods citywide, sued, prevailed and forced the city to perform a comprehensive environmental impact study. O’Brien’s effort was rightly scorned by the city’s own hearing examiner. The city’s subsequent “Environmental Impact Statement,” released last October, prepared by staff and a multinational consulting firm, is nothing but a 1,213-page marketing piece supporting a predetermined outcome, brushing aside critical economic, infrastructure and amenity issues. On behalf of every neighborhood, the Queen Anne Council appealed the adequacy of the EIS in hopes of remanding the study back to planners for a transparent and real-world specific analysis. The hearing begins March 25. The challenges to increase densities citywide are huge and nuanced, requiring a commitment to be neighborhood specific and inclusive, not homogenized as one-size-fits-all unsupported declarations. As we strategize how best to grow, let’s do so respectfully and inclusively. The council must recognize that top-down policies, absent public involvement, ignore the unique specific issues and opportunities anchored within our cherished single-family neighborhoods.